BrightStar came in 2nd place in CSCU’s Facebook Contest. We will receive a $1000 grant, which we’ll donate to the Broward School homeless student education fund. In addition we will donate an extra $2500 making the total $3500. Thanks for voting! Why Credit Unions are a cheaper way to bank, from the Wall Street Journal. Did you know we offer free online courses to help you improve your financial knowledge? Here’s one about checking account management. 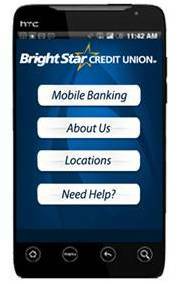 You can now access your BrightStar account on your mobile phone. Just go to m.bscu.org. Also, smart phones apps are coming soon. The Best Free Checking in Town! Did you know? Some of the big banks have eliminated free checking and raised fees, but at BrightStar totally free checking remains alive and well. Plus we offer thousands of free ATMs and Visa Extras points on debit cards. See for yourself.